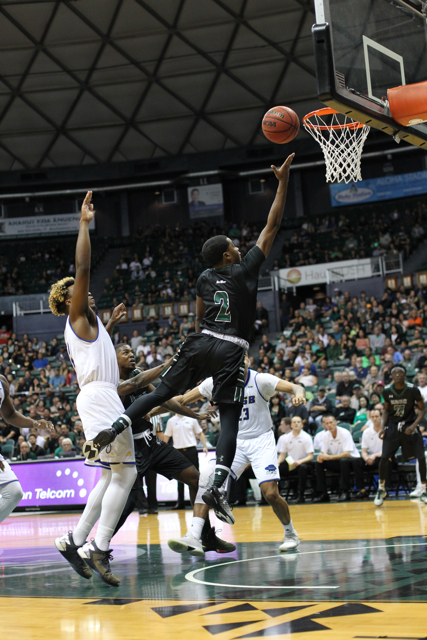 Gibson Johnson scored 18 points and Brocke Stepteau added 12 points and five assists tonight to help Hawai’i hold off visiting UC Santa Barbara, 77-76, in thrilling Big West Conference men’s basketball action. A spirited crowd of about 6,500 at the Stan Sheriff Center watched Mike Thomas and Sheriff Drammeh each add 11 points as the Warriors improved to 12-5 overall, 3-1 in the Big West. The Gauchos fell to 12-5, 1-2. UH led, 42-33, at halftime and stretched the lead to 55-39 after an 11-3 run capped by Johnson’s layup off Stehteau’s assist with 15:45 remaining. But UCSB chipped away and eventually drew to 64-63 after an 11-5 surge culminating in Gabe Vincent’s driving layup with 4:10 left. Drew Buggs appeared to seal the victory when he buried a 3-pointer from the right corner to put the Warriors up, 72-65, with 50 seconds showing on the clock, but Max Heidegger answered with three straight free throws seven seconds later to close it to 72-68. Heidegger, who scored a game-high 19 points, later swished a high-arching 25-footer from well beyond the top of the key to close it to 76-73 with 9.2 ticks remaining. After Johnson sank one of two free throws one second later, the Gauchos worked the ball to Marcus Jackson, who drained a 3-pointer from the right corner as time expired. Hawai’i’s next game is scheduled for January 20, when it will host UC Davis at the Sheriff Center.